To digress a bit...if you haven't discovered the fun in creating your own boards and saving photos for future reference on the Pinterest website, you really must check it out! I have gotten endless recipes, papercrafting ideas, and even a photo of a hairstyle that I took to my hairdresser the last time I got my hair cut - lol! Since pink/black/white is one of my fave color combinations, I knew I wanted to start with that. Lil' Inker Designs has just released this large flag die, so that was another element I included. 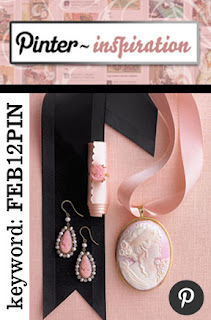 The picture has an overall feminine theme with the elegant ribboned cameo necklace and the bling of the earrings, so I chose to use the Fleur de Lis Nestie to frame this lenten rose image - so fun to color with Copics! I fussy-cut the image and popped it with foam dots then added some sparkle with Diamond Stickles to the centers. So, I'm crossing my fingers and toes that maybe...just maybe...I'll win some new stamps. 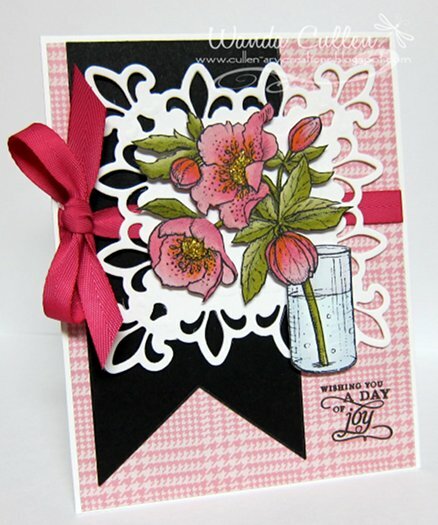 Have you seen the glimpse of the new sets to be released soon by Flourishes? OMG...the design team has really outdone themselves with the sneak peeks this week! ACCESSORIES: Flag die by Lil' Inker Designs, Fleur de Lis Nestabilities, Copics (RV32, RV34, RV93, Y18, YG91, YG93, YG95, BG0000, B0000, C0, C1), Raspberry Fizz ribbon by PTI, Diamond Stickles. This is fabulous, Wanda! Love that nestie and your flower is fabulously coloured. Great card. Oh my goodness, Wanda, I just adore this, every single thing about it...swoon!!! Wanda, the large sentiment flag die is the PERFECT backdrop for your beautiful and amazing flowers! This is gorgeous and I'm finding it hard to type as my jaw is on the keyboard, LOL!!! Abolutely lovely work!! Thank you for the wonderful nod to our new product and link as well! Beautiful Wanda, that fussy cutting is worth it. Thanks for playing in Flourishes Challenge. OOOH Gorgeous - love that die but too! Wanda, your coloring and cutting is beautiful Great card. I really love how the placement of the black and the medallion die balance this image! Really lovely Wanda! Thanks so much for playing with us in the Noon-Time Challenge! Gorgeous Wanda! I love your layout! Good luck and thanks for playing!